Why Ultima in this day and age of ultra realistic gaming? Something about the abstraction of those ultra-low resolution figures really sparks the imagination for me. There’s just enough there to suggest what it is, but you supply the details in your head. The same goes for the world — seeing everything reduced to its barest iconic representation can actually give you the sense of more wonder and mystery than when everything is starkly delineated in high-res 3D graphics. For me at least! Plus, it was my first RPG — practically THE first RPG – so it just made a huge impression on me as a kid. Also I think that Richard Garriott really hit on something simply with the style of gameplay. It’s turn-based, but it’s fast – meaning that you can stop and start at will, but it’s quick to run around and do things. There’s something satisfying about the clicking of these little discrete steps across the map. That’s true especially of Ultima II, from which the Lowlander games draw the most. I like the feeling of just running around, exploring and encountering fun little scenarios that the game-developer has made for you. 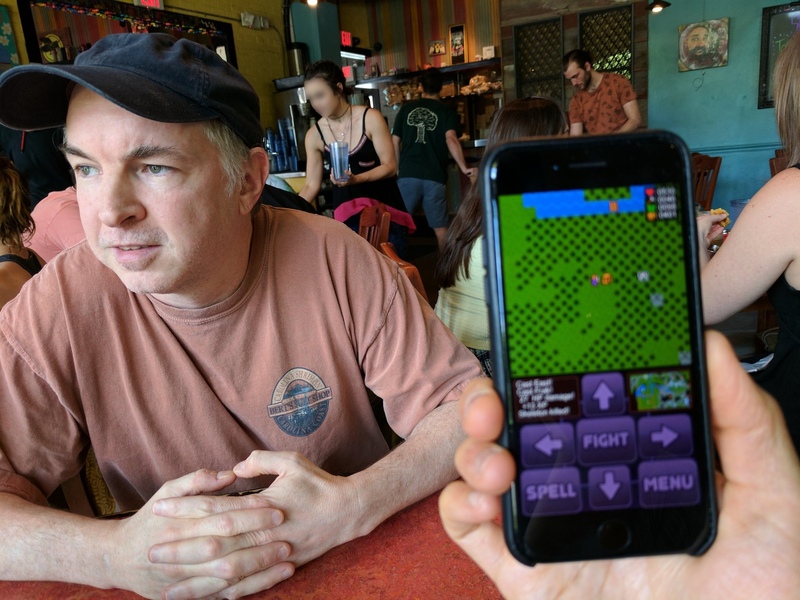 Did you really reach out to the creator of Ultima? How did that go? Absolutely — it was a weird thing because for so long I’d wanted to create my own Ultima game, and I was slavish about the fidelity. Even something like adding color to the characters I would not do, because to me that black and white is essential! It makes them seem like chess pieces. Yet I hate ripoffs. One change I did make was to lower the character/tile resolution from Ultima’s 16×16 to 11×11 pixels — it makes the game look like a subtly cartoony take on the original. Anyway because it was so much fun to do, I got nearly to the end of it despite constantly worrying about what a ripoff it was. It was the best sort of compulsion, but I felt very conflicted about actually releasing something so obviously based on someone else’s celebrated work. Luckily I had met Garriott fifteen years before and interviewed him, and I know Starr Long, who works closely with him. So I sent the game to Starr and asked him what he thought, and if he could put me in touch with Richard. I got a very nice note back from Richard a few days later saying that he had “enjoyed his brief first life” in the game, ha ha! He also said that he was honored I would build something in the style of UItima and in no way found it an infringement of his work. So that was a relief, and very exciting! What artistic principles hold Lowerlander together? It felt like a low-rent version of what I imagine writing a novel is like. I just slowly worked my way forward through it, concentrating on one little set piece at a time and trying to make it work together as a whole. The first game was easier because it was the first time doing something, so there was the excitement and challenge of creating a thing, and the sense that whatever I did, as long as it worked then it would be fine. With Lowerlander, it was harder because the motivation wasn’t as strong — been there done that. But people liked the first one and wanted a second, so that propelled me. I enjoy the whole process, too, making these little towns and dungeons and populating them with funny characters. So I just focused on that and let it come together organically. I remember for like a whole year I was muddling through the middle and had no idea how to wrap up the story. I spent hours in the gym lap pool trying to work through various story strands as I swam. Can you share any sketches you made (preferably photos of paper but not needed)? What can I expect as a Lowerlander 2 gamer if I can make it to the ending? This thought: “What did I just waste 14 hours on! ?” Haha. I hope you will experience a thrill at having saved the world and taken down an evil villain. Maybe you’ll have some funny memories of the odd little characters you met along the way. And there is a pretty cool last shot, I will say. I hate when games end without a proper finale.